What causes broken or teeth? How are broken teeth diagnosed? What is the prognosis for broken teeth? Each individual tooth is composed of calcium and several other organic components. 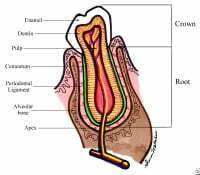 It is divided into 3 layers: enamel, dentin, and pulp - each layer having a specific role. Enamel is a hard outer protective coating. It is the hardest substance in the body. A similar substance called cementum provides a protective coating over the root. It differs from dentin by virtue of its porous nature. Most of the tooth is composed of dentin, which is found directly beneath the enamel. The pulp, the innermost layer, contains the blood supply that nourishes the tooth as well as nerve fibers that provide pain and temperature sensation. It also produces the dentin. Full array of adult teeth Click to view larger image. 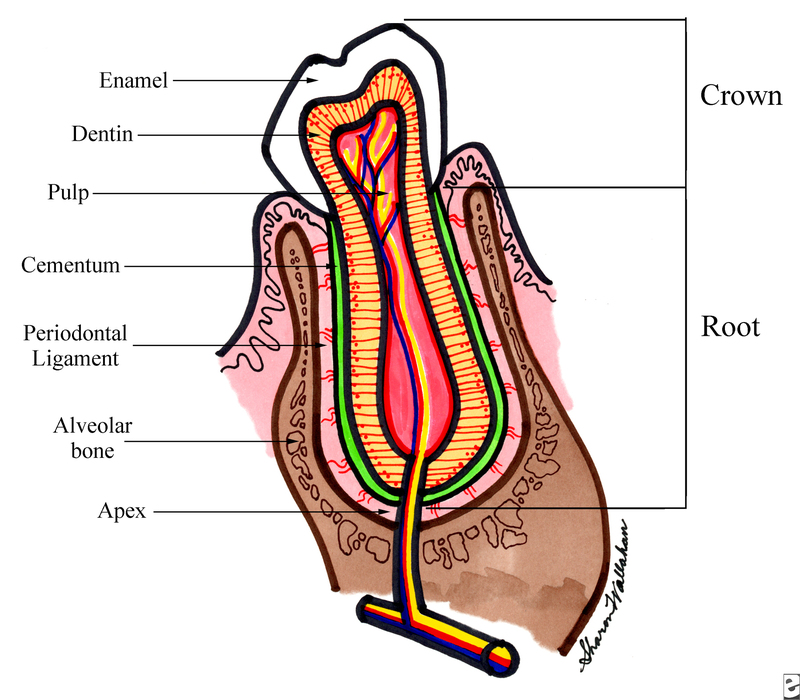 Anatomically, the tooth is made up of the crown and root. The crown is the visible portion you see inside the mouth. The root extends beneath the gum line. 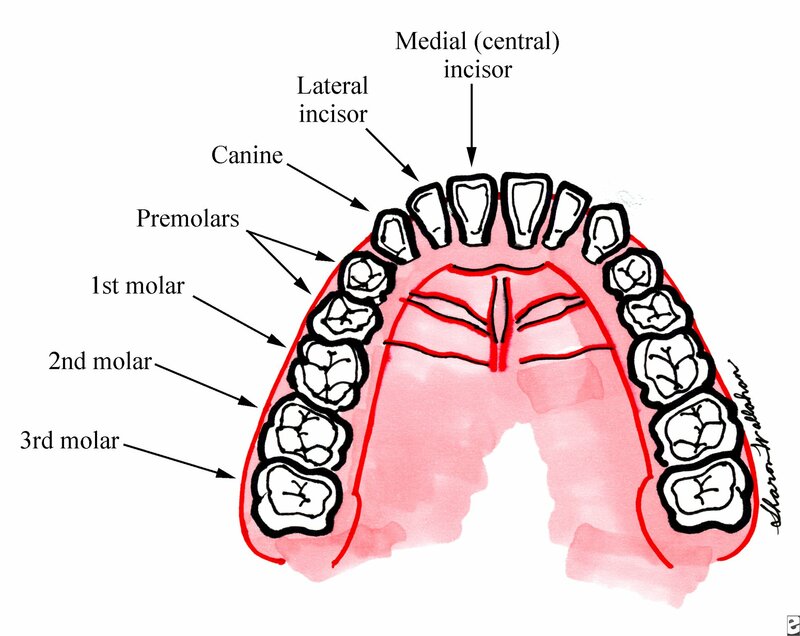 The tooth is positioned in a bony socket called the alveolus. It is anchored by a ligament and protected by the gums. The structure of a toothClick to view larger image. The 20 primary or baby teeth are replaced, beginning at about 6 years, with 32 adult or permanent teeth. Injury to teeth, especially permanent teeth, can be painful and serious. Dental injuries to the teeth commonly occur with falls, assaults, sports activities, child abuse, and multiple trauma such as an auto collision. Toothache and jaw pain are common symptoms of dental injuries. Some people may complain of pain with chewing or with temperature changes. Although a tooth may have broken off, loosened, fallen out, or been pushed into the gum line, other less common symptoms may be seen. How dentists assess the type of damage to a tooth. Click to view larger image. If you have a concern about a possible tooth injury or change in tooth color, call your dentist or doctor. Often when teeth are knocked out, however, you need to seek emergency care, especially if the tooth is a permanent one. If there is no other trauma, the doctor or dentist will take a history of events leading up to the injury. A focused examination of the face, neck, mouth, and the teeth follows. The doctor or dentist will look for damage to the jaw, salivary ducts, and nerves, as well as to account for all missing teeth. For a single tooth injury, a plain dental x-ray will be taken, although most hospitals do not offer this type of film. A panoramic x-ray may also be taken to detect dental injuries. This image is taken as the device sweeps around the jaw in an arc and permits a thorough structural evaluation of the teeth, jaw, and soft tissue structures. It is typically found in most oral surgeons’ offices, as well as in some dental offices and some Emergency Departments. If a tooth is missing and is suspected to have been swallowed, a neck or chest X-ray may be taken to try to find it. The tooth may end up in the throat, lung, or stomach. 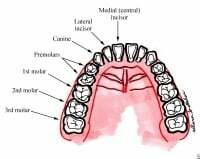 The Ellis classification is a way to grade or describe tooth fractures. The higher the number, the more serious the fracture. An Ellis I fracture solely involves the enamel. This is the proverbial "chipped tooth." It is usually painless and more a cosmetic problem than anything else. An Ellis II fracture extends through the enamel and stops at the dentin. Usually the tooth is sensitive to cold. 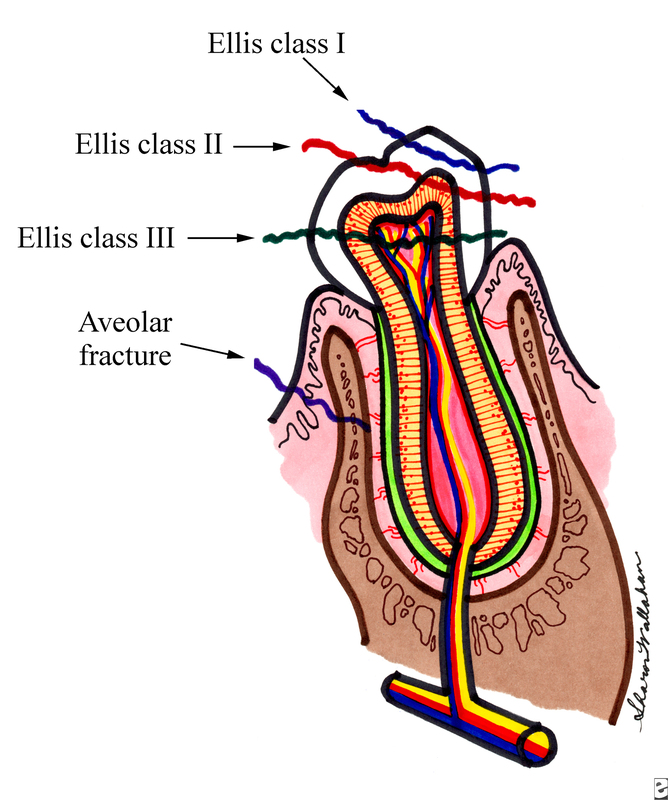 In an Ellis III fracture, the injury extends through all 3 layers, exposing the pulp. Typically you will have extreme pain, often accompanied with mild bleeding from the tooth itself. Before focusing on the teeth, be certain that a life- or limb-threatening injury is not present. For example, if someone fell 10 feet and is not responding, and there is a puddle of blood by the mouth with teeth scattered about, don’t assume there is an isolated injury to the teeth. In the grand scheme of things, dental injuries can wait. Many people may be uncomfortable reimplanting the tooth on their own. If this is the case, be sure to transport the tooth to the doctor or dentist in saline, milk, or saliva. In children or uncooperative adults, the tooth ideally should be placed in a "tooth saver" solution, which can be provided by your health care professional. Effective substitutes include saline, milk, or saliva. An uncooperative adult or child may swallow the tooth. Of greater concern, the person may inhale it, causing a choking episode. If bleeding from the socket is seen, rinse the mouth out with water. Place a wad of tissue or gauze on the socket and bite down on it. The pressure exerted will usually stop the bleeding. For loosened, pushed in, or broken teeth, avoid eating or drinking anything. If the tooth is broken in pieces, retrieve any remaining parts and transport them in one of the suggested solutions. For teeth that are just loose in their socket, treatment is simple. Avoid hard foods. Teeth with significant motion will need to be stabilized using wire, metal arch bars, or a plastic bond for 10-14 days. For knocked out permanent teeth, the sooner the tooth is put back in its socket, the better its chances. The best chance for survival occurs if the tooth is reimplanted within 30 minutes. Once implanted, the tooth must be stabilized using the techniques just described for 2-4 weeks. Broken teeth are managed according to their Ellis classification. For a minor chip (Ellis I), no acute treatment is necessary. You might need mild pain medication for comfort. This injury typically needs a cosmetic repair that can be completed by a dentist. For the more significant tooth fractures (Ellis II and III), certain steps are employed to reduce infection, control pain, and reduce the chance of permanent damage to the pulp. You may be given antibiotics in the Emergency Department. Pain medication can include acetaminophen (Tylenol), ibuprofen (Motrin), or a narcotic medicine, such as hydrocodone (Vicodin). In some cases, a nerve block (injecting a long-acting local anesthetic near the injured tooth) can be performed. In Ellis II fractures, the exposed dentin is covered with calcium hydroxide, which provides a protective covering for nerves and blood vessels. An Ellis III injury (where the pulp is exposed) will need continued dental care. A pulpectomy may need to be performed. Immediate bonding is another option. For adult teeth that are pushed into the gum line, no acute treatment is necessary if the tooth is stable and not likely to fall out. An x-ray will be needed to look for a fracture in or near the socket. In most cases, the tooth will push itself back out, returning to its normal position. The only exception occurs with a primary (baby) tooth. If it injures the developing adult tooth below it, permanent damage may occur, resulting in cosmetic disfigurement or loss of the permanent tooth. In general, any time a tooth is struck, microscopic nerve or blood vessel damage may occur, even without apparent initial injury. The damage may show as a color change over a period of days to months and lead to the death of the tooth. Whether in the Emergency Department or a dental office, follow-up care is of paramount importance. The dentist or oral surgeon should provide definitive care. Several examinations, over the course of weeks, may be necessary to ensure that complete healing has occurred. Tooth injury can occur if the pulp is damaged, even if no obvious damage is seen. People seldom plan to fall and injure their teeth. Therefore, there is little to offer in the way of prevention other then keeping the environment clear of debris. However, for people engaged in sports, it is wise to use a mouth guard. These rubber devices are inexpensive and could prevent serious dental injury. You can buy them at most sporting goods stores or ask your dentist to fit you with one. For knocked-out primary (or baby) teeth, there are frequently no long-term problems unless the permanent tooth was damaged. Sometimes the remaining baby teeth drift together and narrow the space for the new adult tooth. With adult teeth, the sooner the tooth is reimplanted, the better its chance of survival. Once an adult tooth is lost, it can never be replaced. For broken teeth, the more superficial the injury, the better the outcome. Once the nerve or blood supply is compromised, the worse the final result. Pushed-in teeth typically erupt on their own, if there is no underlying damage to bone, nerve, blood supply, or the developing adult tooth.